How Do I Video Interview...Recent Graduates? Every candidate comes with their own set of unique interviewing challenges. That’s why we’re tackling video interview tips for different types of candidates with this how-to series. Today, we’ll be talking about how to use video interviews to connect with recent graduates. Now that they’ve turned the tassel and started looking for their dream job, how do you figure out if these young and eager candidates are right for your organization? Recent graduates can make great employees. They bring with them fresh blood and new ideas. A recent grad might just have the innovative new idea your company needs to get ahead. However, their dearth of professional experience can make hiring them feel chancy. How can you be sure they’ll thrive in your office environment if this is their first professional job? With an unemployment rate of 12.7 percent for 20 to 24-year-olds, your company is obviously not the only one tackling these issues. Don’t make the mistakes everyone else is making by ignoring this valuable applicant pool. 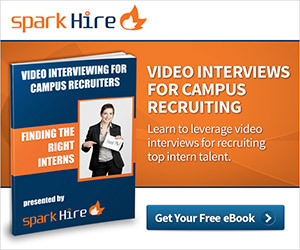 If you know how to use the video interview to find out about recent grad candidates, you will be able to nab this top talent before they get scooped up by a competitor. There are a lot of misconceptions about Millennials and what they’re looking for in an ideal career. An infographic we recently posted looks at some of these Millennial myths and debunks some of these tall tales. What are Millennial candidates really looking for in their careers? The answer is engagement, opportunity for growth and job satisfaction. While speaking to Millennial candidates in the video interview, make sure to stress how your company provides plenty of feedback and gives employees the chance to better themselves through challenging work. If you sell your company as a place where recent graduates can begin moving up their career ladders, you’ll attract more motivated employees. With the high unemployment rate for recent graduates, you want to make sure you’re hiring someone who is truly passionate about your industry instead of someone just looking for a paycheck. Those willing to take the job for the paycheck only will be the first ones out the door when something better comes along. This is why it’s important to use the video interview to evaluate Millennial candidates’ passion for the industry. Some of this passion you’ll be able to see right on the resume, whether it’s a traditional resume or a video resume. Did the candidate take part in industry-related activities and groups? Did they join a professional organization? Do they talk about industry trends on their social media profiles? Did they use their skill set to give back to the community through volunteer work? All of this will tell you something about how passionate and dedicated your Millennial candidate is. Most recent grad candidates hate this question, but ask about their five-year plan anyway. This will allow you to see if their career goals align with your company’s. If their goals don’t include your industry or don’t seem to align with the position, watch out before hiring. These are the kind of employees who will leave when something more fitting to their career aspirations comes along. Having never held a professional job before, the working styles of recent graduates can be a bit of a mystery. Do they work well with others or are they a lone wolf? Will they fit into your company? You know what kind of employees you need in your company, whether you’re searching primarily for self-directed workers or team players. Ask questions in the video interview about how they’ve worked in the past on projects with team members and evaluate what their career goals say about their ideal working style. Then determine if this is the kind of employee your open position calls for. Recent graduates can be a valuable asset to your company as long as their career goals align with your company’s hiring needs. Look at these evaluation criteria in the video interview to hire the best young employees for your company. What are some of your tips for evaluating recent graduates in the video interview? Share in the comments!